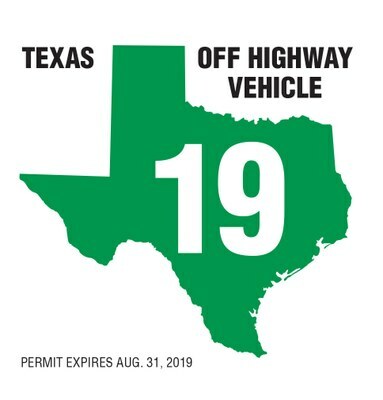 Texas OHV decals are $16 and are good Sept. 1 - Aug. 31 of the following year. Revenues generated by the sale of the decals are used to create new and improve existing OHV recreation areas in Texas. OHV decals are required by law for all individuals operating an OHV in Texas at an OHV legal venue which is located on the public lands of Texas, or on lands which have received OHV grants from the Texas Parks & Wildlife Department. Call the TPWD Service Center at (512) 389-8917 Monday through Friday, 9 a.m. to 5 p.m. CST. Decal sales by appointment only, please call for appointment.